All these years, the global economy was going through downturns and aftershocks. Geopolitical issues weighed heavily on the trade activities. Both TCS and RIL are more global companies considering their share of revenues from overseas - TCS has over 90 per cent revenues coming from abroad while RIL has 50-60 per cent. The five digital forces - mobility, big data, social media, cloud computing and robotics - changed the way TCS operated. And Chandrasekaran and his team showed the agility to adapt to the exponential changes. In this period, billionaire Mukesh Ambani-controlled RIL faced huge volatility in oil prices and currency fluctuations. But RIL maintained its gross refining margin, outperforming global refining benchmarks, thanks to its high-tech twin refineries in Jamnagar, which can refine most types of cheap crude and make products according to market demand. 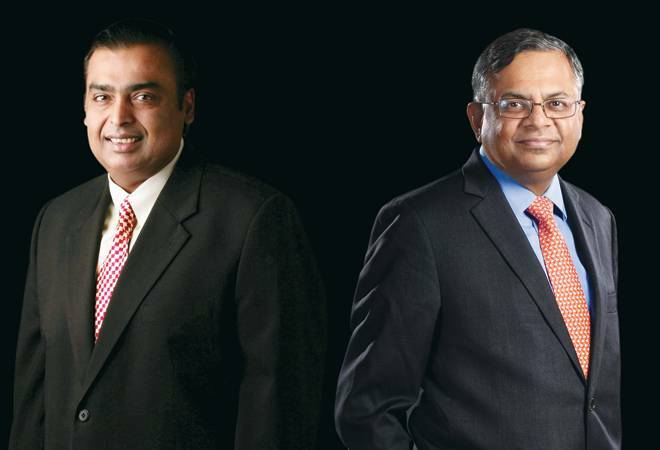 "Both TCS and RIL are more global companies considering their share of revenues from overseas"
Both the giants are nimble-footed enough to take up challenges. Chandrasekaran tells Business Today that the discretionary spending in digital transformation has slowed a bit this year: "There was a pull-back in discretionary spending, but we haven't seen any cancellations fortunately. We anticipate that the negative sentiments will be reversed in the second half of this financial year." TCS is sharply focused on the opportunities in the digital transformation era. "The combined power of technologies is creating opportunities and possibilities for us," he says. Also, Chandrasekaran has inherited a prudent platform like TCS, built by his legendary predecessors Faqir Chand Kohli and S. Ramadorai.